The article below was originally writen by Noah Alam on his blog dedicated to garlic. Some times ago, his blog was removed from the internet. Fermentation of Garlic – In other words, how to ferment garlic and get all its benefits. I’ve read some times ago about the wonderful qualities of fermented garlic and how it will help our bodies, in fact, in one website, the author suggests that fermented garlic is much more potent and helpful to our bodies than normal raw garlic. I wanted to be sure of this, so I tried to make my own fermented garlic, however, there were many guides on the internet on how to make fermented garlic and for the most part, the results are pretty misleading. The best recipe I could find is this one, I’ve tried it over and over and even given it to some friends that reported it’s nice texture and similar results as I got. First, how can fermented garlic help your health? Let’s make a distinction from the start, garlic should not be considered like a drug, in other words, you shouldn’t eat some cloves of garlic from time to time and expect huge benefits. From my own experience, the best results are obtained when you incorporate garlic to your way of life and you make it a routine, after some few weeks, you will start to notice amazing results on your health, from milder, even nonexistent, colds to very low levels of cholesterol and better insulin absorption. This is the reason why fermented garlic can be a great resource for you. You see, eating raw garlic everyday can be a painful thing to do, especially if you have a busy life, with all the peeling, crushing, preparing … It takes time and will be accompanied with some very nasty side effects like a bad body odor. Fermented garlic will give you the benefits of garlic in a very convenient way. About thirty to forty peeled cloves of garlic, better to use a very hot variety, the redder the better in my opinion. Leave the blender running with all your cloves for about thirty to forty seconds, you have to get a kind of smooth texture. If you get a very liquid one, sometimes, the cloves can add moisture, add in more cloves. If you get a pasty texture, simply add a table spoon of apple cider vinegar. Put in your glass jar and close it very tightly. Leave in in your garage or in an isolated area for about four weeks, some people will tell you to leave it in the sun, don’t, the sun’s ray will damage the good chemical compounds and will make this fermented garlic milder in effects. When the four weeks period has passed, you can put your glass jar in the fridge and use it whenever you want as long as you close it tightly when you are done. This fermented garlic is best eat in the morning, two table spoons should be more than enough to get the best of garlic in a very convenient way. Do you know some other uses for fermented garlic? I am wondering if the garlic has to blended or if it can be left whole. Also, is fermented garlic good to cook with. Can this method also be used to preserve garlic? It has to be blended or else it will just sit in the apple cider vinegar. It’s also easier to eat this way, I usually take one to two teaspoons before sleeping. Noah prefers to take it in the morning but I have to warn you: fermented garlic smells even more than raw garlic! My last batch was prepared maybe 3 months ago. I keep it in the fridge and it’s still perfectly good. 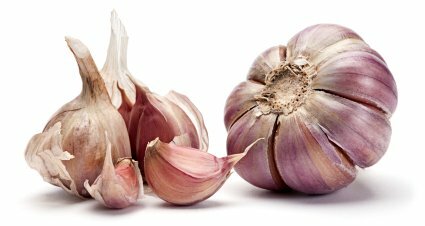 Fermented garlic will not give you the “bad body odor” like unfermented raw garlic? Maybe the reason for fewer colds is the garlic first thing in the morning… I know no one would talk to me if I just had two table spoons of garlic…. Or is it 2 teaspoons? Thanks for the recipe. Yes, it will not give you the bad body odor – when I was eating unfermented raw garlic, I had this body odor but not with the fermented one. Does it make you smell too? Thank you so-o-o much for this information. I have been trying to figure out haw to get the leaky gut healed. I’m 67 and have had this most of my life. Paying forward a blessing, I find that sprouted fenugreek is great for countering the bad oder of garlic that comes out on your skin. Fenugreek has a pleasant East Indian herbal fragrance and is easy to sprout. Rinse and soak the seed overnight. Cover the seeds with at least three times as much water as seed.In the morning, rinse and drain, then cover with a lid that has holes in it. Sprout in room temperature. By the next day the sprouts will have “tails” and will be ready to begin eating. Rinse your baby sprouts and look through to remove unsprouted seeds. Be careful chewing at first in case you missed some unsprouted seeds. They will be hard like small stones. Rinse and drain sprouts every other day and refrigerate in the container with holes in the lid. I prefer to sprout in glass rather than plastic. I find that Anchor and Pyrex bowls with plastic lids work well. They come in varying sizes. They look nice on the counter and stack well in the fridge. I put holes in the lids by heating a small metal skewer on the stove burner, until the tip is glowing, then quickly make several holes in the top of rim of the lid about a half inch or more apart. Have a bunched up wet paper towel near by to wipe off the plastic that is on the skewer, before reheating to make more holes. Make sure the room is well ventilated. I’m sure that melting plastic is not good to breath. When finished making the holes, take a small paring knife to shave of the melted plastic that is left around the holes. This step is important so the holes are smooth and there are not areas that will not clean well. I put the holes along the upper rim of the lid so I can stack the bowls without covering the holes. Those sprouts need to breath. Of all the sprouting containers that I have used over the years, these are my favorite.